But without replenishing water and foam concentrate supplies (along with anything other media and equipment that might have been used), the immediate response capability would be so severely limited as to make the presence of the vehicles almost irrelevant. If hoses had been run out to hydrants for the first event, repacking them will take time and tenders without water/extinguishing media and without hoses to draw additional water are of even less value. Looks like 1, possibly 2 firetrucks deployed any hoses, the rest, along with their crew are standing around twiddling their thumbs. Meanwhile an entire airport is shut down. Totally unacceptable. Well don't accept it then. Thcweam and thcweam and thcweam about it until you are thick! Go sit in the middle of a taxiway and have a paddy! Boycott Heathrow! 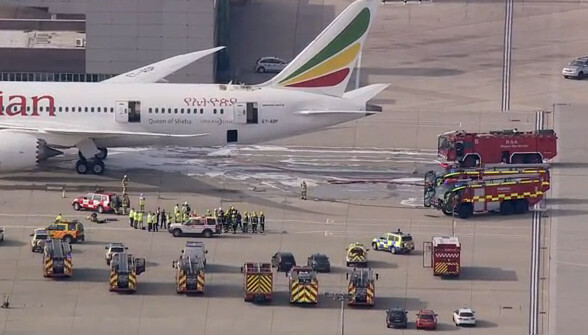 I'm reasonably sure that Ethiopian Airways, & Boeing, are both very glad that Heathrow Fire Service decided to wait around ready to get stuck in again until it was certain that the fire was out and wouldn't be re-igniting any time soon. How many firemen does it take to check that a fire they put out stays out? Apparently the heathrow firedept think the answer is 80 firemen and 12 firetrucks. Not very confident with the expertise or abilitys by the looks. Normal people would think 1 (if any) with a hand extinguisher might actually suffice, although being right next to the fire station, in a remote area away from the runways/terminals wouldn't impact that decision at all either. Im an active vol firefighter and I've also been embedded at Gatwick airport and other UK stations attending callouts. I'd say that the majority of the smaller trucks in the aerial view are from neighbouring non airport fire stations and are not airport service trucks. In respect to activity after the smoke has cleared. Some of the thumb twidling was a debrief. Debriefs are vital for ongoing training and improvement of response, especially given that a typical airport fire service has very few actual fires compared to a city station. Non airport fire service vehicles may need escorting in and out. The fire service also has to be available to respond to numerous calls within terminals and hangers. A fire on any vehicle that potentially contains thousands of gallons of fuel that is located near a building occupied by thousands of members of public is always going to be dealt with on a worst case scenario. How long does it take to be assured that fuel tanks have not been compromised and the source of ignition has been found and extinguished/made safe? There are a myriad of odd bizzare and low probability risks that have to be factored. ie who is to say that an electrical problem on the damaged 787 would start unwanted fuel dumping? None of the above tasks is easy to fully investigate in a complex craft with numerous batteries and fuel tanks. Also a little time taken to deal with contaminated turnout kit and replenishing foam and water all add up. So that the airport was closed for an hour is not surprising. The simple solution is to have significant extra capacity of vehicles and crew at a significant extra cost rather than to suggest poor practice and management are to blame for a one hour closure. Exactly who above has had any formal fire department experience ? Exactly who above has extinguished a fire on a composite aircaft ? Some types of portable fire extinguisher produce lethal gas when applied to burning metals as well as producing corrosive residue and an exothermic reaction. The crap left after the fire, given it is in a confined space is itself a hazard, it is no surprise that emergency crews should hang around to secure the scene and have breathing apparatus to hand to effect further response or rescue. Numerous fire crews and accident investigators responding to military jet crashes have been hospitalised even though they were wearing PPE. 20% to 40% of impact survivable fatalities are caused not by flame but toxic gasses. The first gulp of carbon monoxide disorientates the second gas incapacitates and prevents your escape. So think about that before you run into a smokey airframe. Last edited by mickjoebill; 14th Jul 2013 at 06:43. I suspect the fire crew will have remembered the last time a 787 caught fire on the ground (it does seem to happen rather regularly ) and planned for a rather long episode. So Fritz did not shut down FRA, just one runway? THAT was a smart decision. LHR have shut down several times, even when one or both runways were available. In this day and age we can fly into two runway airports without using an alternate. When you shut down a major airport you risk getting several fuel emergencies. Who decides to shut down LHR, the operational management, or fire and rescue? Last edited by ManaAdaSystem; 14th Jul 2013 at 06:14. Looking at photos of the 777 at SFO - I cannot imagine the condition of a 787 and the survivability in a similar accident. Not good I suspect. At approximately 1550 hrs UTC on 12 July 2013 a Boeing 787-8 of Ethiopian Airlines, registration ET-AOP, suffered an event at London Heathrow whilst the aircraft was parked on stand, with no persons on board. The initial witness and physical evidence shows that this event resulted in smoke throughout the fuselage and extensive heat damage in the upper portion of the rear fuselage. In exercise of his powers the Chief Inspector of the Air Accidents Investigation Branch (AAIB) has ordered that an investigation into this serious incident be carried out, in accordance with the Civil Aviation (Investigation of Air Accidents and Incidents) Regulations 1996 and the Standards and Recommended Practices of Annex 13 of the International Civil Aviation Organisation (ICAO). The sole objective of the investigation is to determine the causal and contributory factors of this serious incident, with the intention of preventing a recurrence. It is not the purpose to apportion blame or liability. In accordance with these international standards and recommended practices, the National Transportation Safety Board (NTSB), USA, representing the State of Design and Manufacture, and the Civil Aviation Authority of Ethiopia, representing the State of Registry and Operator, have been invited to appoint Accredited Representatives to participate in the investigation, along with advisors from the Federal Aviation Administration, Boeing Commercial Airplanes and Ethiopian Airlines. The AAIB has also invited the participation of the EASA (European Aviation Safety Agency) and the UK CAA (Civil Aviation Authority) as advisors to the investigation. As to criticism of the actions of the fire crew, fellow PPRuners, please remember the Heathrow Fire Team are especially trained to deal with aircraft fires and their managers will be under no illusion as to the cost of keeping the airport closed. They will also have studied the causes of past disastrous aircraft fires on the ground. Before the scene of a fire is vacated, the fire team have to sure there is no chance of re-ignition, and until then, they need to be able to deal with the worst case scenario. The extend of the damage in the upper skin area is far beyond the size of the high glossy composite 59 minutes repair brochure under laboratory conditions. For me it looks like a "rear section replacement". Forget about the "metal type repair" out of the sales brochure and face CFRP reality beyond coin size damage. Mr. Steven F. Udvar-Házy and others will learn a lot in the coming months. Seems to me that everybody is very tight lipped about the source of the fire. By now a large number of people would have inspected the plane and it would be obvious where the fire originated, even if they cant ascertain why. Boeing really need to quickly calm the world concern as a matter of protecting their reputation and the future of the 787. Location: KGRB, but on the road about 1/2 the time. Being a composite fuselage, the 787 fuselage has the potential to be MUCH stronger than the 777 fuselage, and hence more able to withstand higher impact forces...it depends on how they used the carbon fiber in making the 787 fuselage. As to how well the 787 fuselage compares to the 777 fuselage in fire-resistance, I have no idea. No criticism of the fire crew or procedures here. An unattended aircraft caught fire. I regard that as serious. You have no idea how comforting it is to have 'armchair-experts', like yourself, ever ready to give profound and insightful comments such as those you have made. I am in shock and awe. On second thoughts, no, I'm not. Last edited by londonman; 14th Jul 2013 at 07:55. If I recollect correctly, the aircraft was being prepped for towing when the fired was noted. It may be pure coincidence but the "Grounding 787's" thread also makes mention of towing being an issue with the battery fire. The APU Battery supplies the APU Hot Battery Bus ONLY. AFAIK it's job is to start the APU when no other power is available and power the Nav Lights when towing without APU. Thats it. Just one thing. The towing switch is a selected function, not automatic. Depending on Main Batt charge state, there may only be enough power for a half hour tow. My understanding of the refined battery system. The min discharge level has been increased. This will shut the battery down at a higher charge, but will mean that it can still be recharged in-situ if normal power is returned to the a/c. EG A non-APU towing scenario, on bat only. instead of, say, 30 mins of useable power from the bat, one may only have 25 mins. The bat circuit automatically shuts off power and then when the GPU is connected the battery will recharge. I could be wrong, but this seems the most logical outcome, otherwise we are still going to be changing batteries ad-nauseum due to towing operators not monitoring the bat state. Regarding the discussion about the fire response. Several pages back, and on other sites on the internet, multiple people have stated there were also fire trucks called out to a separate incident (from memory, a Boeing PIA). So when you're making your expert analysis - seemingly based solely on a picture of a few trucks - do remember that you're probably not privy to everything that was going on at the time. TWT, I am aware of that. Never suggested it had anything to do with the battery per se, but as the cause of the battery malfunction has never been accurately determined, and this fire seems to be when the aircraft is undergoing similar activity, namely towing related, there could be some connection. Last edited by alisoncc; 14th Jul 2013 at 08:12. "no evidence of a direct causal relationship"
I fully understand that this needs to be investigated thoroughly and this will take time, but this carefully loose phrase does not reassure me about the entire battery and electrical system. Add to this the fact that Boeing seems to have declined strong advice to insulate the roof structure, and that the Manchester 787 had electrical faults relating to toilets and galleys all leaves me very uneasy. The Dreamliner reminds me of the British Advanced Passenger Train, in which every single component was new, radical and unproven. The project ended up seriously behind schedule, massively over-budget, and was then pressed into trial service too soon. It was technically superb, but unreliable and a failure. For the time being this is one Boeing in which I am NOT going. Hear hear! I would only add that the entire aviation industry is harmed in such cases, especially now that there is essentially a global duopoly for the manufacture of advanced passenger jets. Unfortunately, if you go through every speculation as to cause, in this thread, not one is likely to have a good outcome. A faulty coffee-maker? Yikes....that's arguably the most frightening of all.